The DecisionPoint Price Momentum Oscillator (PMO) is based on a Rate of Change calculation to track changes in trend strength. The PMO is a smoothed version of the Rate of Change. When price moves up, PMO moves up with the positive price changes. When price moves down, PMO declines with the negative price changes. The PMO oscillates around the zero line. In the chart above, the PMO is blue above the zero line and red below the zero line. A blue PMO implies bullish trend and a red PMO implies bearish trend. The signal line provides additional signals when the signal line (red) crosses the PMO line (black). The PMO is based on exponential moving averages and it lags. The higher the smoothing, the greater the lag. Lagging means that price turns first before the PMO crosses the zero line but earlier signals can be generated using the signal line. The Daily USD/JPY chart below has the PMO and the DeMarker on it, which we discussed in the previous article. A quick comparison of these two oscillators shows the DeMarker being more sensitive to price changes. Also the scale is from 0 to 100 for the DeMarker, whereas the PMO goes above and below the zero line. Since the DeMarker is more sensitive than the PMO, it is important not to get lured into going against the trend too prematurely with the DeMarker indicator. In a strong bullish trend the DeMarker will bounce above 70, and the PMO will just continue to rise as evident in the USD/JPY chart below. TRENDS: The first step is to look for signs that a market is trending or about to trend. This can be done by looking at the fundamentals and focusing on markets that are starting to move. Create a watch list. 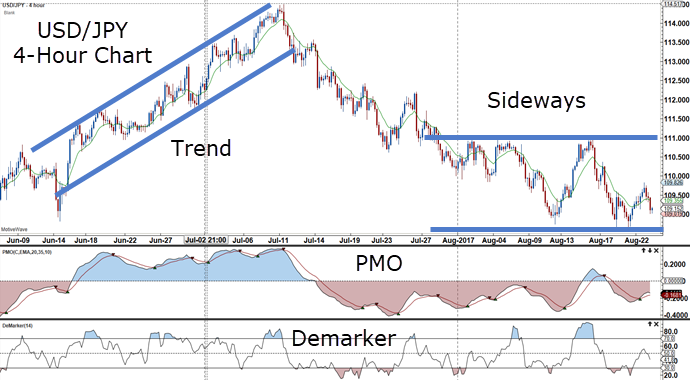 After deciding that a stock sector, currency grouping or commodity is about to trend, then use the PMO indicator to join the trend. In the USD/JPY Daily Chart above, look at the trend on the left. When the PMO indicator crosses the zero line, that would be a conservative time to start paying attention to a possible move up. To join the trend, take note of when the PMO crosses above the red signal line when the PMO is blue above the zero line and consider buying. In a strong uptrend, consider taking profits when the PMO crosses below the signal line, as in the USD/JPY example on the left of the chart. In fact, that is also a good reversal point when the trend has possibly run out of steam. Using a 123 pattern on a smaller time frame could be a confirming trigger for a sell. 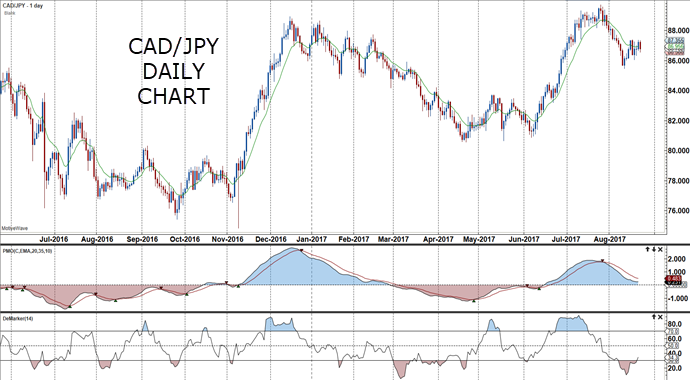 SIDEWAYS MARKETS: When a market is rangebound, as in the USD/JPY Daily Chart after the initial trend move, the PMO oscillator is a good tool to use to signal buy and sell signals when the market is overbought and oversold. Look for the PMO crossing below the signal line at market tops and the PMO crossing above the signal line at market bottoms during sideways markets to trigger a change in trend. 123 reversals on a smaller time frame are also good confirmations with this reversal signal during sideways markets. These signals work on all time frames, but I like to do a top down approach and use the larger time frame for the context, and the smaller time frame for trade entry. For example, in the 4-hour chart below, the PMO provides additional entries to join the trend. Every time the PMO crosses above the signal line when the PMO is blue above the zero line, the trend is buyable. Every time the PMO crosses below the signal line when the PMO is red below the zero line, the trend can be sold. Another example is with the CAD/JPY Daily Chart below. Notice how well the PMO keeps traders in the trend, once the PMO initiates the trend above or below the zero line. At the end of the uptrend in the middle of the CAD/JPY chart, the crossing of the PMO line below the signal line provides a nice exit strategy with the potential to go short. When the PMO is in red territory, the cross of the PMO line above the signal line provides an exit strategy for the short trade and a possible long entry. A confirmed long entry is when the PMO moves above the zero line into blue territory. 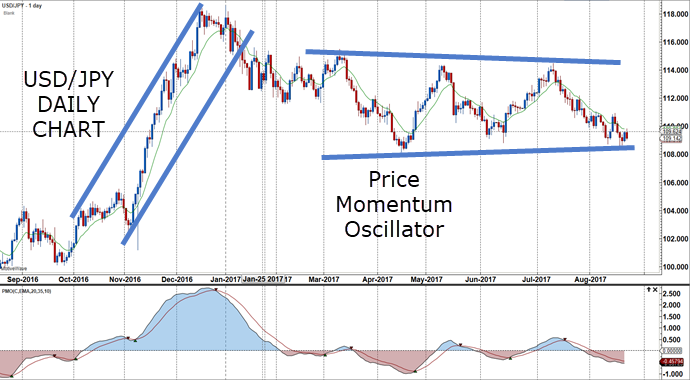 Learn how the DecisionPoint Price Momentum Oscillator helps put traders in the trend as it is progressing, and also provides profit targets by using the signal line. Start incorporating the PMO indicator into your chart set-up. Finally, use the PMO indicator in developing trading strategies with other indicators. 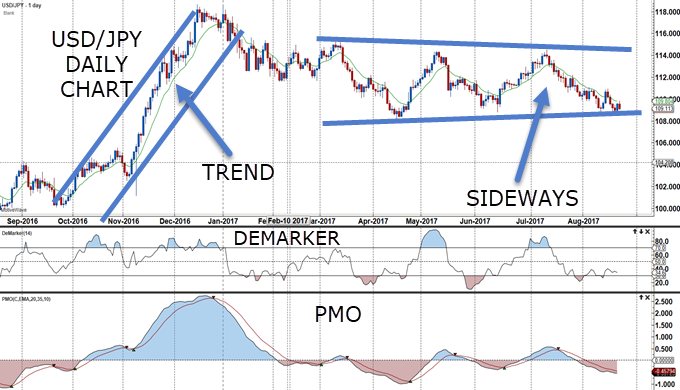 This entry was posted in Trading Tips and tagged DecisionPoint Price Momentum Oscillator, forex, forex trading, forex trading online, forex trading system, indicators, trading strategy, trading system.